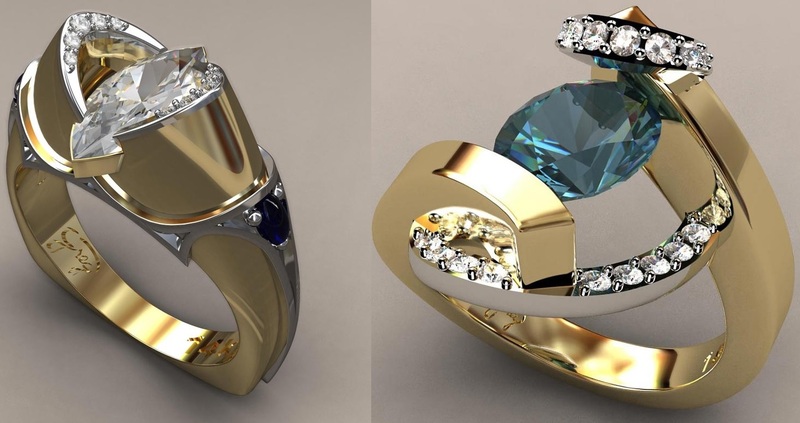 These are some of the most innovative designer ring creations in today’s market, and these designs will endure the ages. These designs are unique, and inspirational passion went into creating each one these gorgeous designs. The designs have articulate and intricate movement in the settings which makes you feel as one with these masterpieces. The gemstones that are used in these designs are sourced for their beauty and perfection. Some of the most beautiful diamonds and gemstones are placed with intricate passion into each piece by master jewel setters. Greg Neeley has been designing and making jewelry and since 1972. 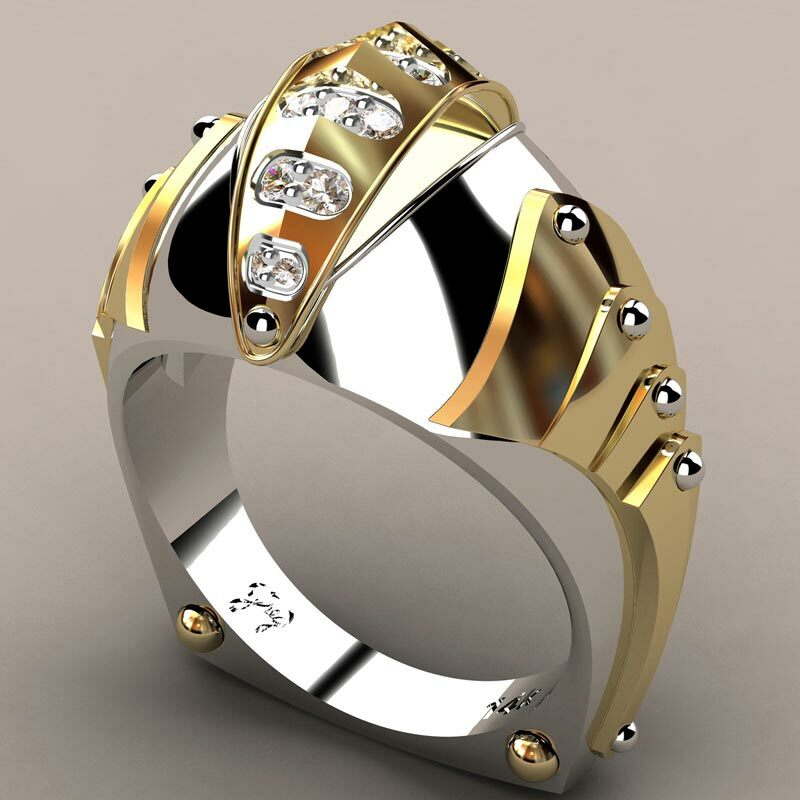 His unique designs and attention to detail are unsurpassed in the jewelry industry. Caged Fire, finalist in the 2013 Saul Bell Design Awards This original design by Greg Neeley is made from solid18k rose and 18k white gold. It contains five diamonds. 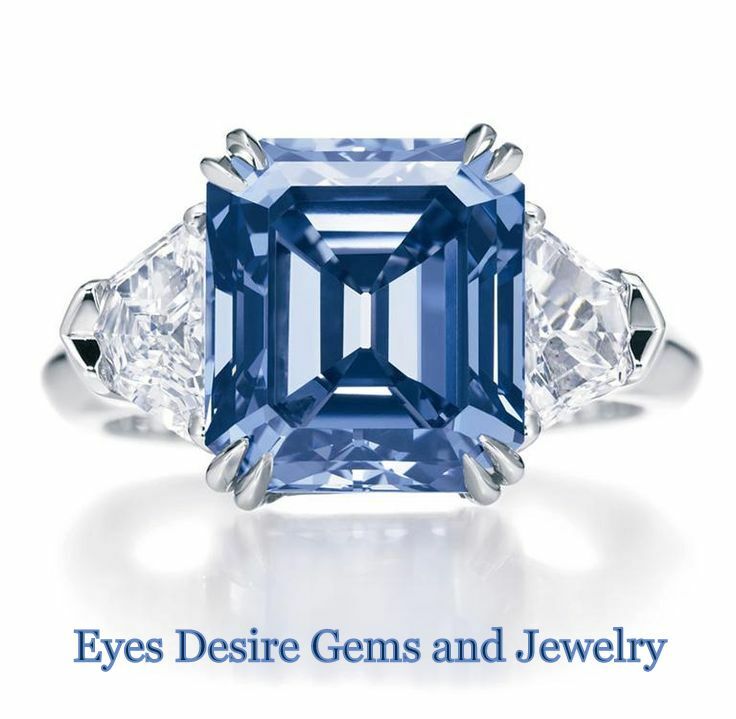 The center stone is 2.23 carats with four diamonds weighing 1.01 carats total set around the center diamond. Caged Fire is for sale and on display at Elinoff and Co. Gallery. This 14k yellow and 14k white gold ladies ring contains one 8×10 mm oval red zircon weighing 4. 85 carats and 27 1.8mm princess cut diamonds weighing 1.06 carats total. The ring is lost wax cast and soldered together. The shank in 18k white gold will be cast with a break in the bottom center, the princess cut diamonds will be channel set and the yellow gold plates soldered into place. 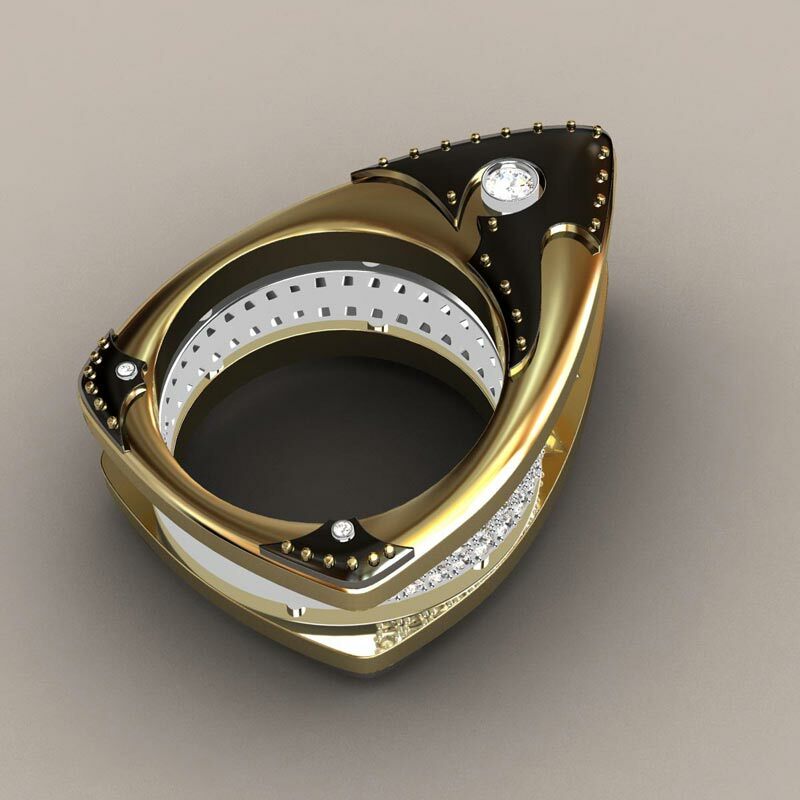 The break in the bottom center will allow the channels for the zircon to be sprung open enough to tension set the zircon then the bottom of the shank will be welded and the ring rounded locking the zircon in place. This ring has a ‘bracket set’ marquis diamond floating over a white gold band set with pave’ diamonds. There is a diamond in the center of each side of the ring. 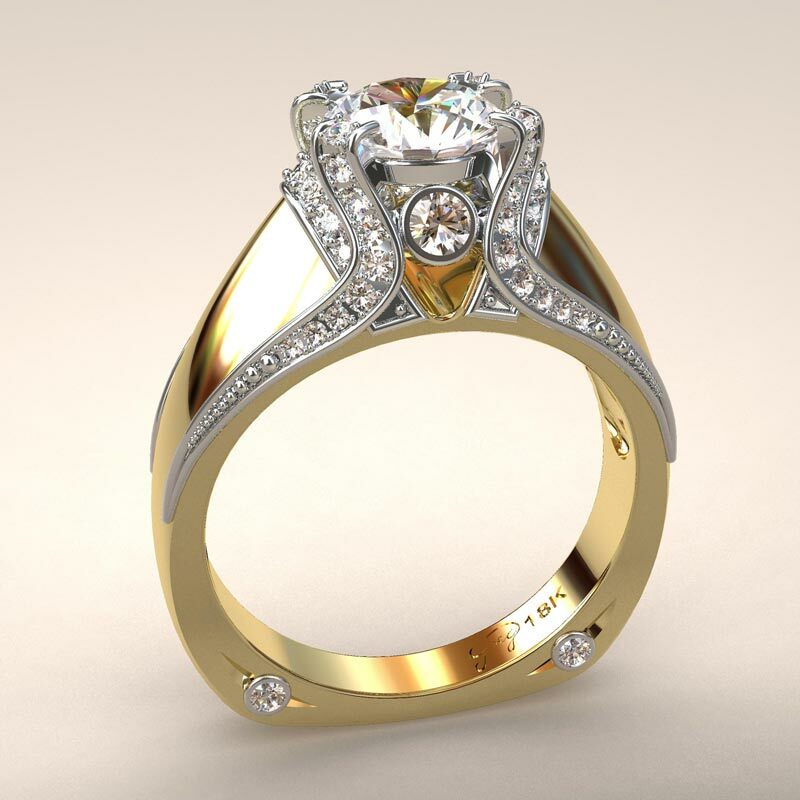 The total weight of 48 small diamonds is a little over 1/2 carat, and the center stone is a one carat marquis. This is a very safe design that looks very dangerous. The marquis diamond points are bare but it would be very difficult to touch the points with anything but a very small probe. 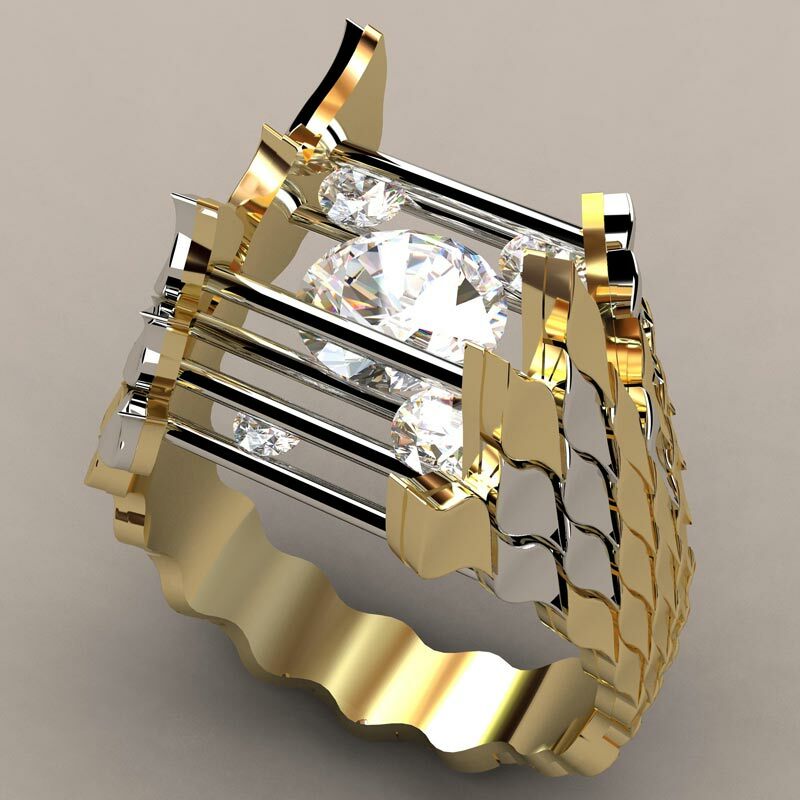 Indian Princess is an 18k yellow gold ladies ring containing 4 princess cut diamonds 1 carat each. 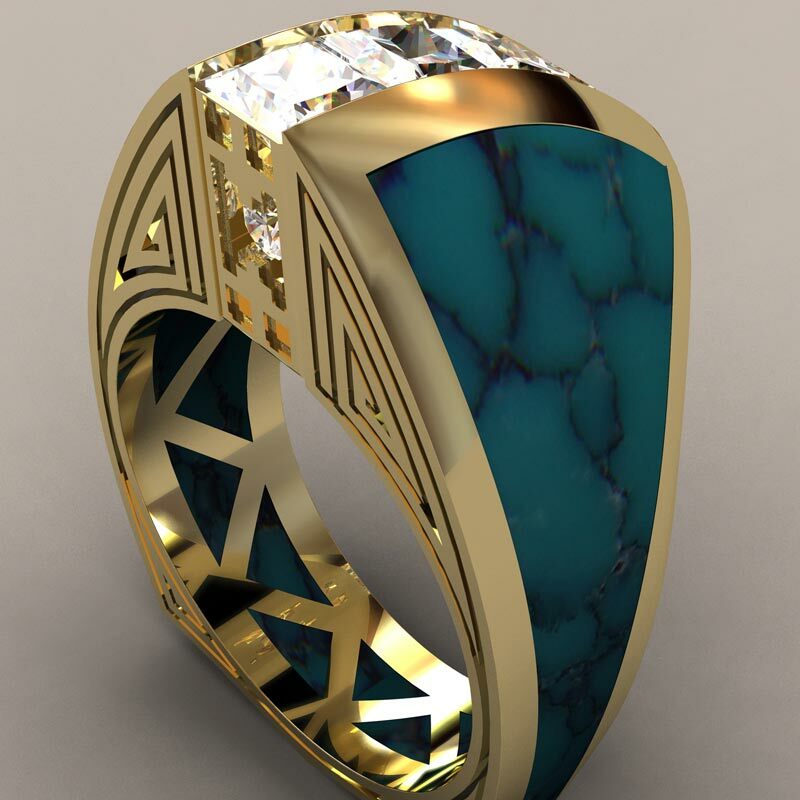 It is made with the highest quality spider web turquoise that is inlaid all the way through the ring so you can see it from the inside. The vertical side of the ring is decorated in a Hopi Indian design and contains one .10 carat fine diamond. 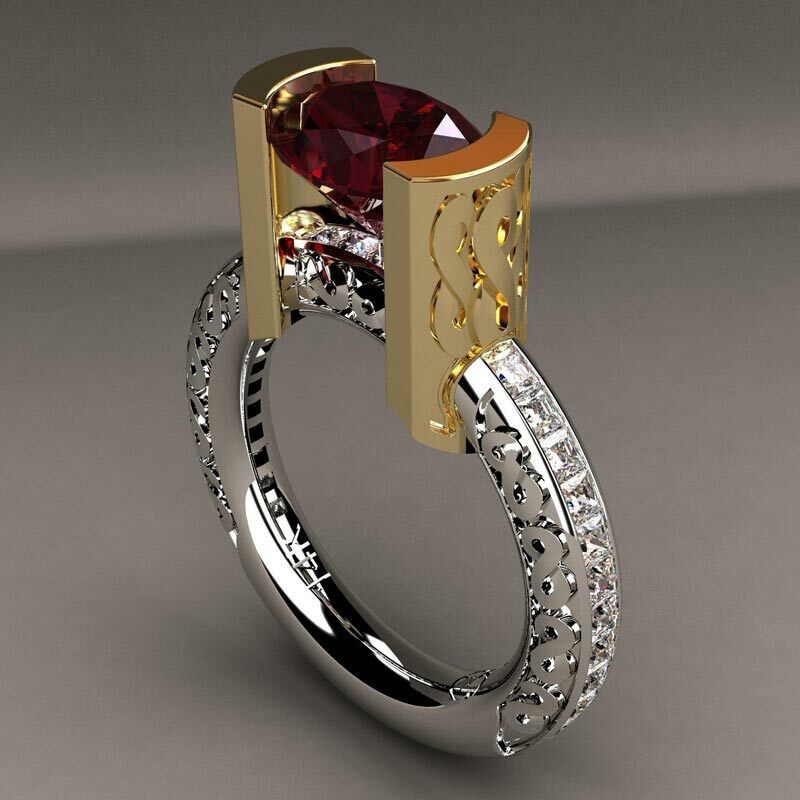 This ring is not for everyone and is one of the most difficult to craft that Greg Neeley has ever designed. The center diamond is 1.00 carat GIA certified round brilliant. It is very well cut graded at color G clarity VS 1. The accent diamonds weight a total of .25 carats and are of top quality. 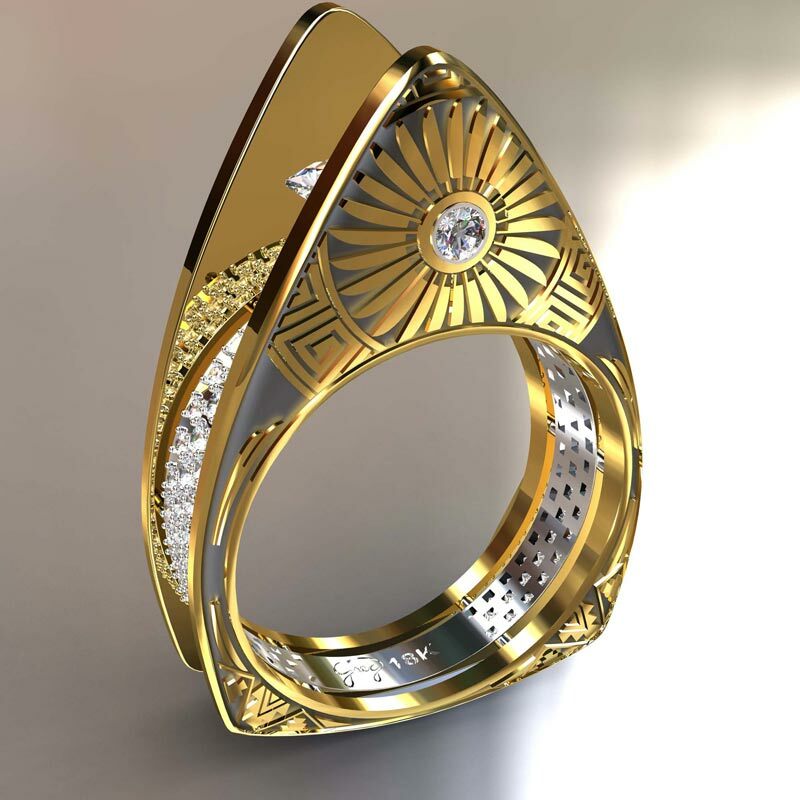 The ring is made of solid 18 karat yellow and white gold. It can also be ordered in all white gold as well. 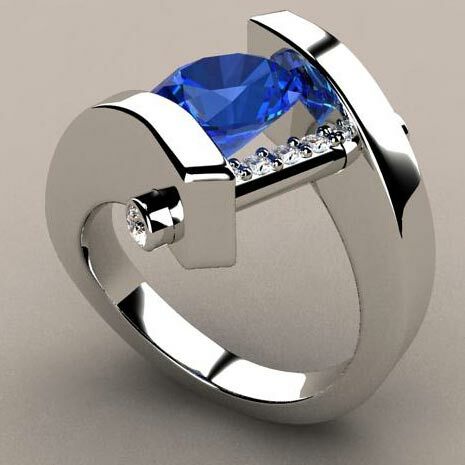 This is a very elegant ring that brings a little Italian flare to one of Greg Neeley‘s ring forms. This solid 18k Yellow and White Gold Men’s ring contains 17 high quality round diamonds weighing 1/5th carat total. The ring weighs over 2/3 ounce of solid gold. It is a very heavy and regal design. This is the latest in Greg Neeley‘s Medieval Knight Collection. This ring is sterling silver and 18 Karat yellow gold with a beautiful spider web Carico lake stone. The Carico lake turquoise is 16 mm by 13 mm about 3/4inch by 1/2 inch. 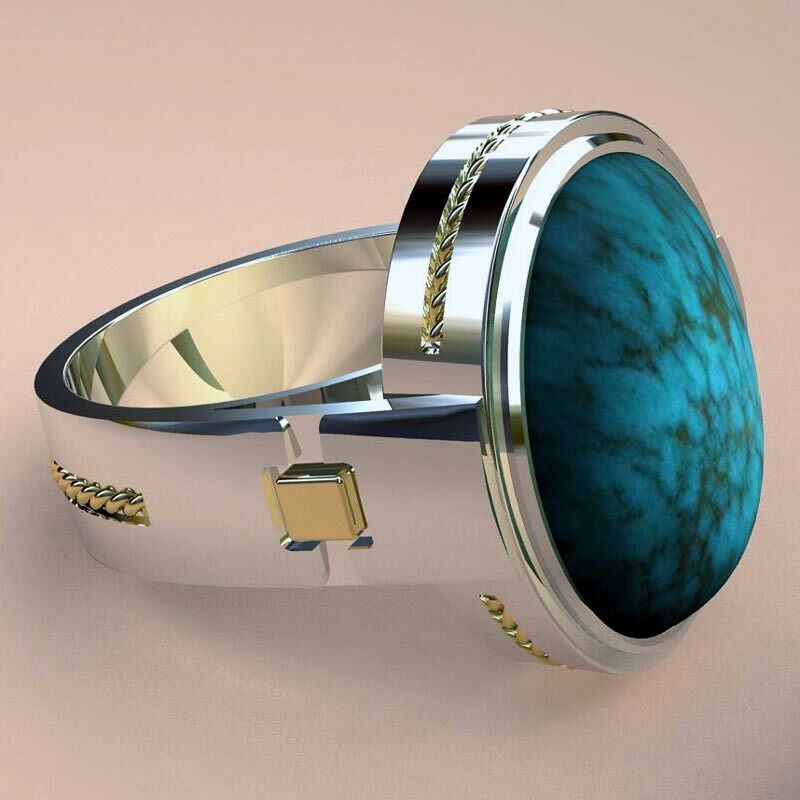 The turquoise weighs13 carats and is re-enforced with backing. The stone is completely natural with no treatment. One of the amazing aspects of this stone is the matrix or brown lines. Many times these lines are of a softer material and tend to degrade and pit during polishing. This stones matrix is crystalline like the rest of the turquoise stone, very rare in natural turquoise. Greg Neeley collected this stone in the late 1970’s when he was a turquoise stone buyer for an Indian jewelry manufacturer here in Colorado. The ring can be made to any size from 7 to 13 for the same price. 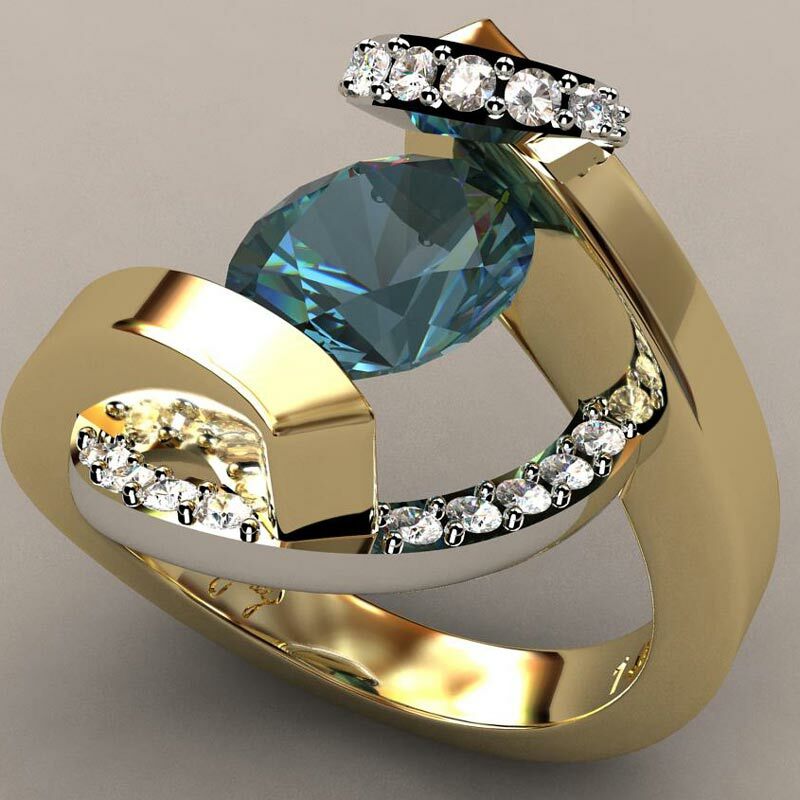 This ring is made of 14k yellow and white gold and holds a 2.3 carat natural aquamarine oval center stone suspension set in a 14k yellow gold wrap around ring with a 14k white gold swirl encompassing the entire ring top. There are 23 diamonds set in the swirl weighing a total of 1/4 carat. This is a simple but elegant and comfortable ring. This ring is made of 14k white gold 3 carat natural aquamarine oval center stone suspension set in a 14k white gold wrap around ring with a 14k white gold bar running through the entire ring top. There are 5 diamonds set in the bar weighing a total of 1/10 carat. This is a simple but elegant and comfortable ring. The ring is made of solid 18k gold. the black metal is 18k white gold with a layer of black rhodium over it. Rhodium is a form of platinum. It is very durable and just about the same price as platinum. There are 52 round melee diamonds in the ring and one 3/4 carat marquis. 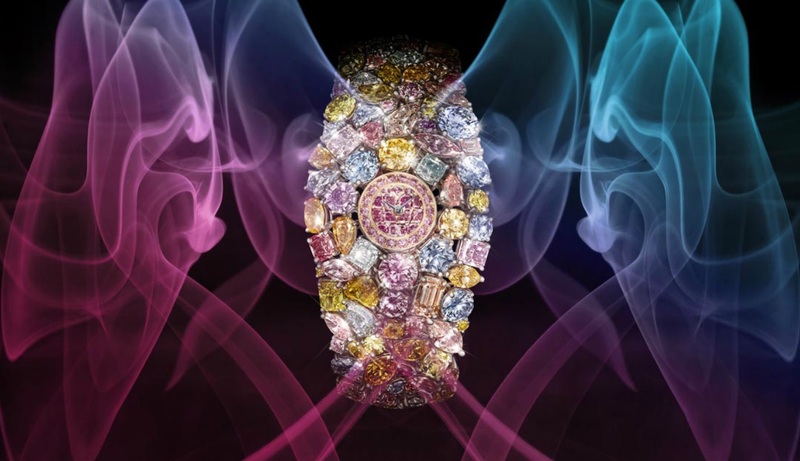 The total diamond weight is 1.61 carats. The Marquis is FLOATING in side brackets with the points bare. 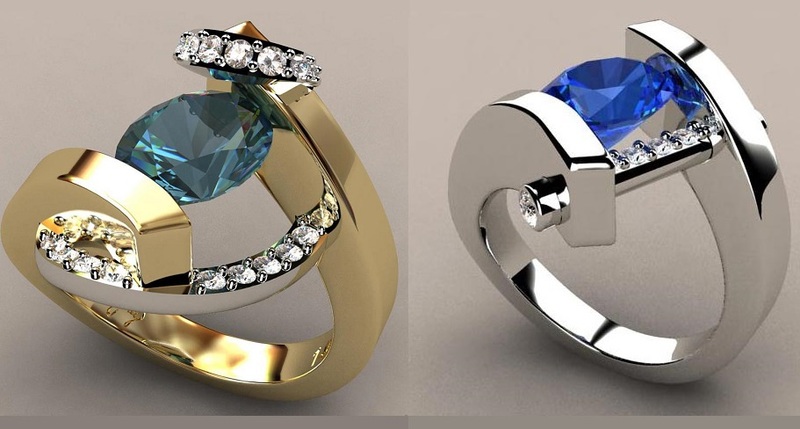 This gives the design a very dangerous look but the stone is protected by the sides of the ring and it would be very difficult to damage the stone. The brackets holding the stone are riveted on and all these rivets are real rivets. 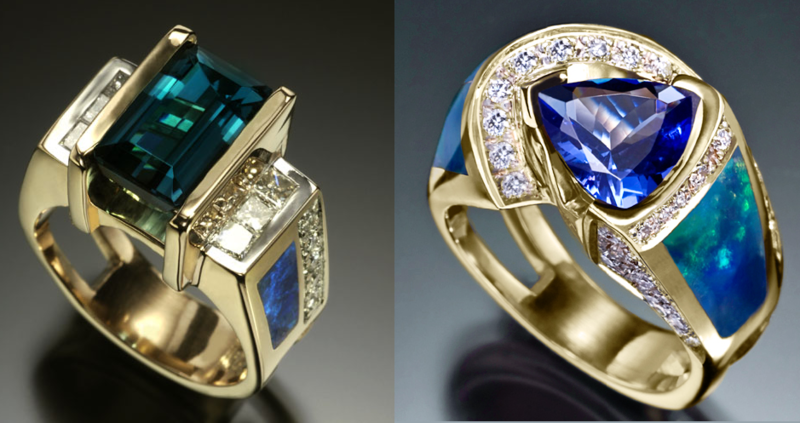 What Kind of a Design and Gemstone are you looking for?